I’ve only really started to enjoy Mexican food over the past two years. Cilantro was never my favourite herb, so it just sort of turned me off of the whole cuisine in general. Like most food though, let me have it 5-6 times and eventually it will grow on me. 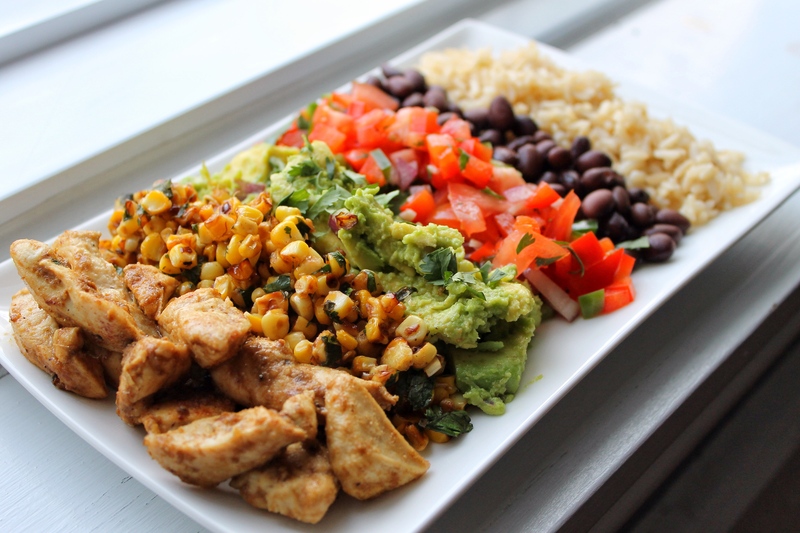 What did always attract me to Mexican food is the versatility and the fresh flavours. There are so many platters that allow you to create the bite that YOU want. Extra guacamole, more chicken, no salsa… no problem. 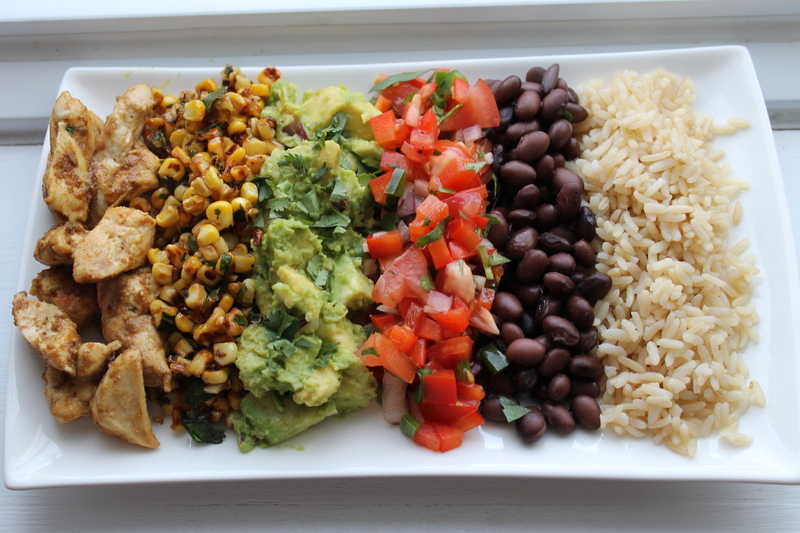 When it comes to Mexican, you become the chef! And thats exactly what I have created here. With this meal, vegetarians and meat eaters alike can create the plate/bowl that best suits their taste buds. This meal can easily be made with tofu/seitan, steak or fish and be absolutely delicious! Feel free to serve with black bean chips (beanitos… yum) or gluten free brown rice wraps and everyone is bound to find something delicious, healthy and fitting to their cravings. We all know I love a good bowl, so no chips or wraps were needed for me. Homemade pico de gallo aka salsa fresca aka a fresh salsa really lightens up the heaviness that can come from the avocado and beans. You can also use salsa from a jar if time isn’t on your side, but homemade is always better! The star of the dish for me was the cumin-cilantro corn. It was so sweet and had so much flavour, ill definitely be using this as a side dish for another meal.If your not in the mood for meat, or are vegan, make this dish with tofu or quinoa for added protein. Perfect for Meatless Mondays! You’ll get plenty of healthy fats from the guacamole and fibre from the brown rice and black beans. I hope you enjoy this seriously tasty meal without the guilt or upset tummy. As always this meal is free of gluten, dairy and refined sugars. Go as fresh as possible with your ingredients, and please enjoy a beer*** alongside! Clean living is all about moderation, life is short…so enjoy it! *** I tried my first gluten-free beer called Glutenberg. It was very decent consideering the lack of barley but it did have a pretty bitter lingering after taste. If anyone has any suggestions for some of the best gluten free beers, please write in the comments! I will be doing a lot of taste testing in the summer and I will do a roundup of some of my favourites. 2. For the rice: cook based on the directions of the bag. Season with 1 tbsp olive oil, squeeze of lime salt and a bit of pepper. 3. For the corn: heat 1 tbsp of olive oil in skillet on medium-high heat. 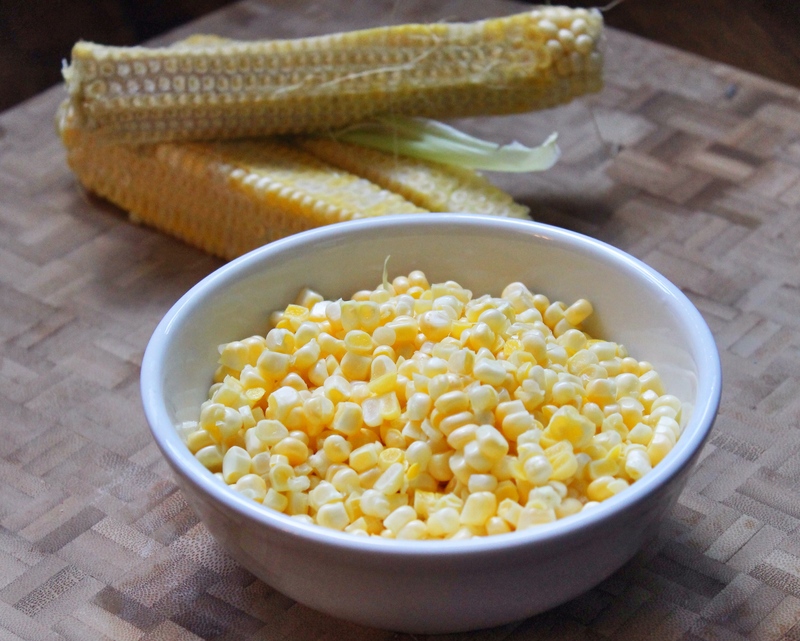 Sautee corn until slightly brown then add a nice pinch of salt, 1 tbsp cumin, 2 tbsp cilantro, juice of half a lime. Sautee for 2-3 minutes, turn off heat and add a little more fresh cilanto and more lime juice. 4. 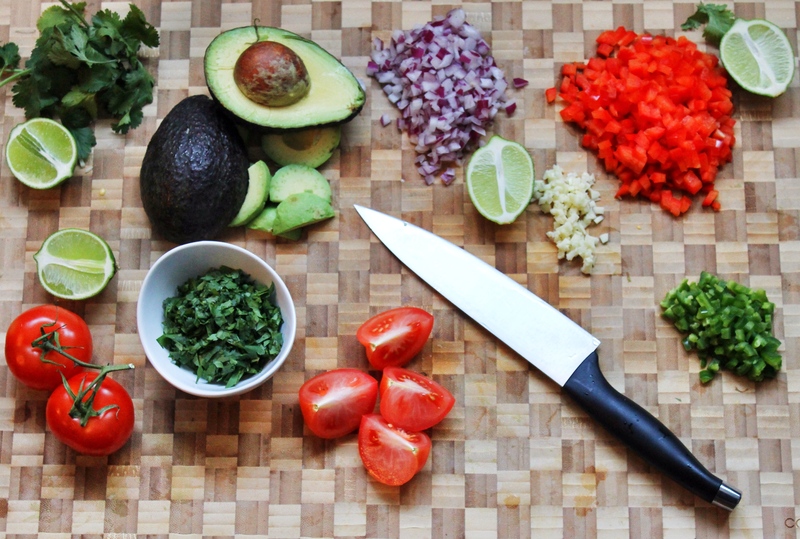 For the guacamole: Mash avocados, add juice of one lime, 1 tbsp red onion, 1 tsp garlic powder, salt. 5. For the pico de gallo: mix jalapeño, fresh garlic, red pepper, tomatoes, 2 tbsp red onion, red wine vinegar, juice of 1 lime, 2 tbsp cilantro and pinch of salt and pepper. 6. For the black beans: rinse very well, season with salt and pepper. 7. For the chicken: heat 1-2 tbsp olive oil in a skillet on medium heat. Sautee chicken with salt and pepper. About half way through cooking, add 1 tbsp cumin, 1 tbsp garlic powder and some lime juice. Cook through and finish with more lime juice. Salmon is loaded with protein and omega-3 fatty acids to give our brains a dose of happiness and intelligence. It is also a versatile and easy to cook. Salmon is one of my go-to’s when looking for a light yet satisfying meal. Whether you eat it raw, oven roasted or pan-seared it is a great base for any seasoning or sauce your appetite desires. My rule when cooking salmon in a pan is to simply let it be. People flip it and move it around which ends up with an unattractive and overcooked meal. Follow my directions carefully for a perfectly cooked, crispy skinned salmon. 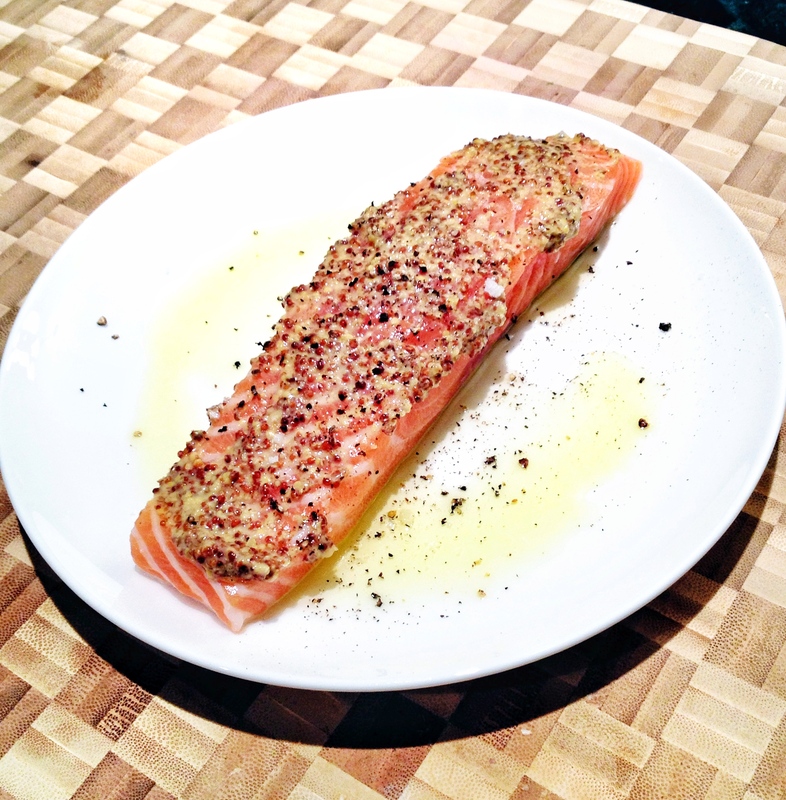 The herb oil I made with this fish is light, refreshing and super easy to make. 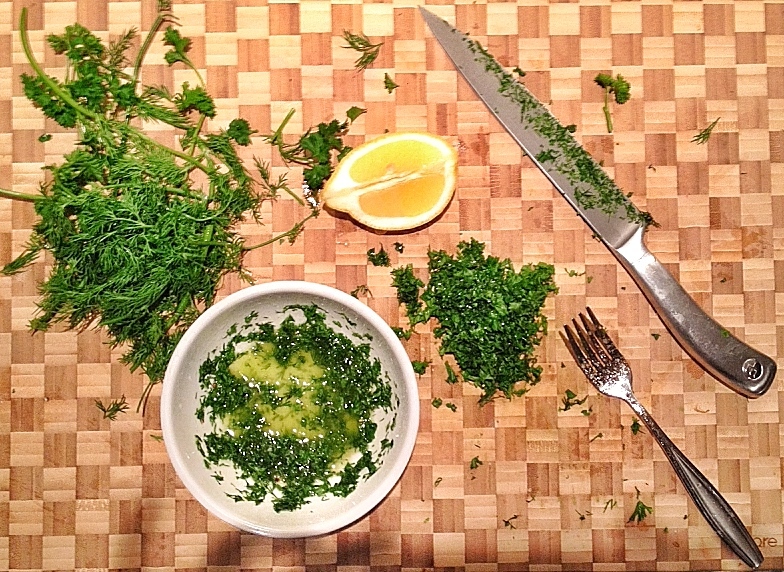 Fresh herbs are a great way to add flavour to a meal without adding extra sauce, oil or seasoning. Dill, parsley, basil are my three favourites but you’ll see how I explore other herbs such as rosemary, thyme and oregano in future posts. Bon appetit! 4. While the salmon is cooking, finely chop up dill and parsley (about 1/4 cup worth) and add to a small bowl. 6. Finely chop one shallot and add it to herbs. 7. Add olive oil, lemon juice and more stone ground dijon mustard if you like to the herbs and shallots and whisk. Season with a pinch of salt and pepper (add more olive oil if it looks too thick). 8. Check back on your salmon! 9. 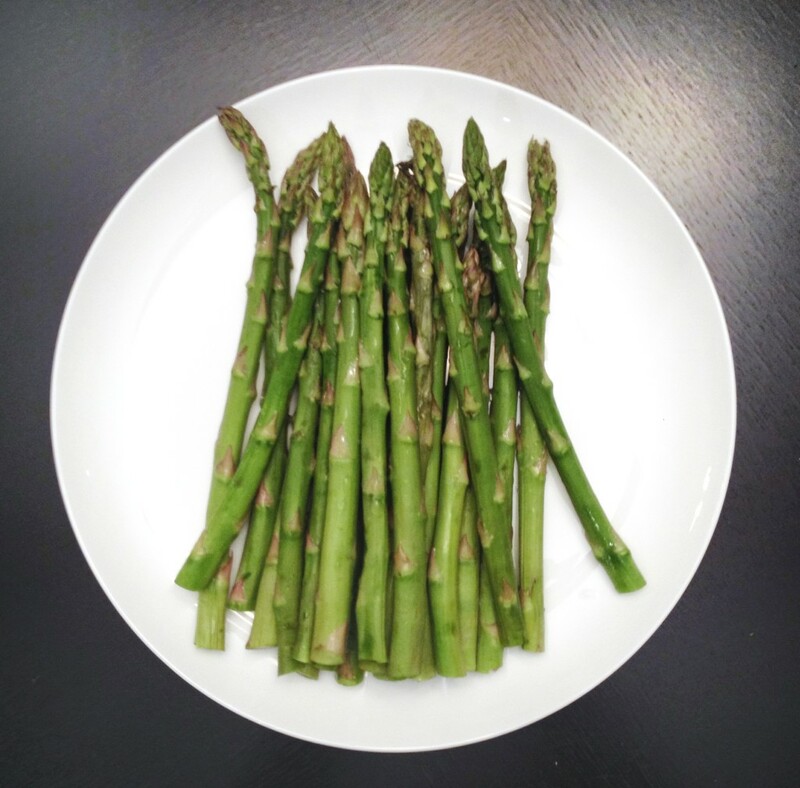 Boil asparagus for five minutes and drain. 10. 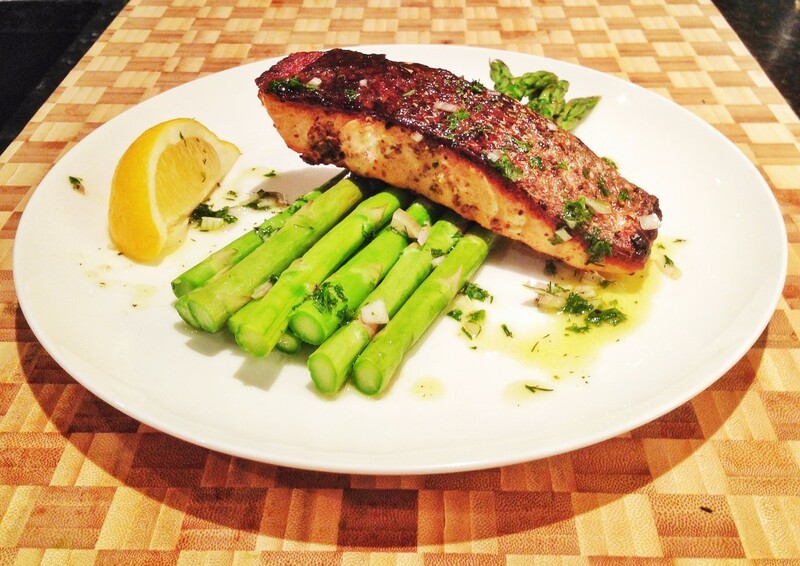 Plate asparagus and salmon, drizzle with herb oil. Enjoy!